Get your scuba gear ready because you are about to take a dive under the sea with ocean crafts for preschool kids like you. Have a blast, but don't spend a dime with the Perfectly Preschool Egg Carton Jellyfish. 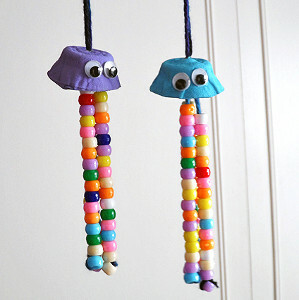 This jellyfish craft is an absolutely adorable summer adornment that is a breeze to make. Crafts with egg cartons are so inexpensive because you can find the materials right in your refrigerator. Gobble down those eggs so that you can start crafting the best ocean crafts for kids. Paint the egg cups, one light blue and the other purple. Meanwhile, create the beaded tentacles. Cut a piece of yarn about 12-inches in length. 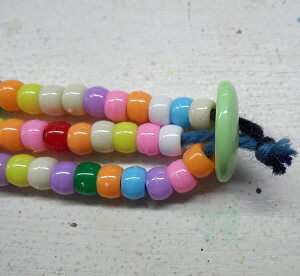 Tie a pony bead to one end. 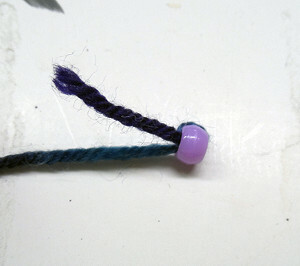 Trim the excess from the knot and rotate the knot so that it lines up with the hole in the bead. Thread on 16 more beads. Repeat this 5 more times. There will be 3 tentacles per jellyfish. 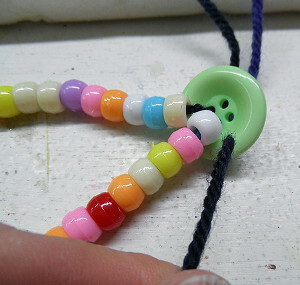 Use a toothpick to push the top end of the yarn tentacle through one of the button holes. Repeat with the other two and a gather the three pieces of yarn together and tie into a knot. Trim the excess yarn. Repeat for the second button. Poke a hole in the center of the egg cup. Take another piece of yarn, about 5-inches in length. Loop it and tie the open ends together to create a hanger. 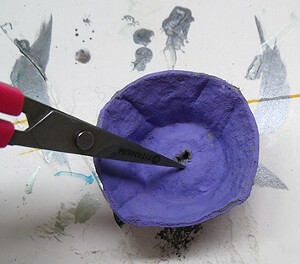 Poke the looped end through the underside of the egg cup and out through the hole. The knot will stop at the hole, but go ahead and secure it with glue. Hot glue the button up into the egg cup jellyfish head. The tentacles will be hanging down. Because this is a bit heavy, allow it to dry completely before trying to display. Glue googly eyes to the front of the egg cup. I hope art teachers visit this website for more exciting projects like this.